Negotiation is a method by which people settle differences. It is a process by which compromise or agreement is reached while avoiding argument and dispute. In order to achieve a desirable outcome, it may be useful to follow a structured approach to negotiation. For example, in a work situation a meeting may need to be arranged in which all parties involved can come together. This stage involves ensuring all the pertinent facts of the situation are known in order to clarify your own position. In the work example above, this would include knowing the ‘rules’ of your organisation, to whom help is given, when help is not felt appropriate and the grounds for such refusals. Your organisation may well have policies to which you can refer in preparation for the negotiation. This stage focuses on what is termed a 'win-win' outcome where both sides feel they have gained something positive through the process of negotiation and both sides feel their point of view has been taken into consideration. See our pages: Strategic Thinking and Action Planning for more information. If the process of negotiation breaks down and agreement cannot be reached, then re-scheduling a further meeting is called for. This avoids all parties becoming embroiled in heated discussion or argument, which not only wastes time but can also damage future relationships. 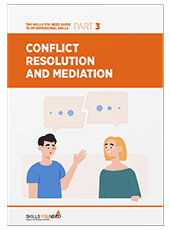 See our page on Mediation Skills for more information. All negotiation is strongly influenced by underlying attitudes to the process itself, for example attitudes to the issues and personalities involved in the particular case or attitudes linked to personal needs for recognition. Negotiation is not an arena for the realisation of individual achievements. Certain features of negotiation may influence a person’s behaviour, for example some people may become defensive. The more knowledge you possess of the issues in question, the greater your participation in the process of negotiation. In other words, good preparation is essential. See our pages: Verbal Communication and Effective Speaking. We provide a lot of advice to help you improve your listening skills, see our page Active Listening. See our pages: Reflection, Clarification and The Ladder of Inference for more information. Build stronger working relationships based on mutual respect. See our pages: Building Rapport and How to be Polite. See our section on effective Problem Solving. Learn some simple techniques to help you make better decisions, see our section: Decision Making. Assertiveness is an essential skill for successful negotiation. See our page: Assertiveness Techniques for more information. See our page: Communicating in Difficult Situations for some tips and advice to make difficult communications, easier.